Are you organizing an event and do you want to run a live draw among all the attendees? Are you running a social media giveaway and do you want to show the winner selection in a video? 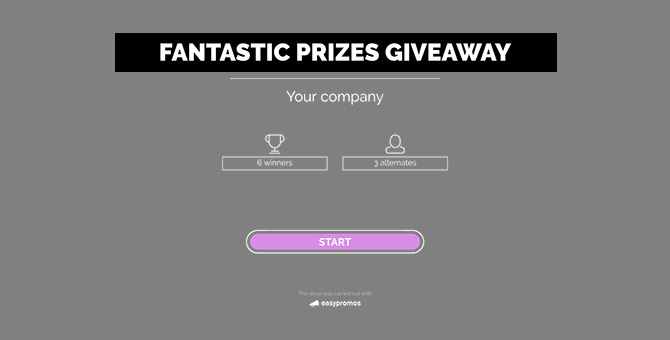 We present to you the "Broadcast Mode" that allows you to present the result of a giveaway in a dynamic format to make the announcement of the winners more entertaining and add surprise and fun to your giveaways. The giveaway in Broadcast Mode allows you to obtain the presentation of the draw in web format through a URL that can be shared in social networks and in any online channel. This option is available for all Easypromos accounts. Customize the contents of the presentation (messages, colors, etc.) to adapt it to the corporate colors of brand/company. Download the presentation as a video file so it can be easily shared on any channel. The Broadcast Mode is limited to giveaways with maximum 8 winners. What is the Broadcast Mode? 1. What is the Broadcast Mode? 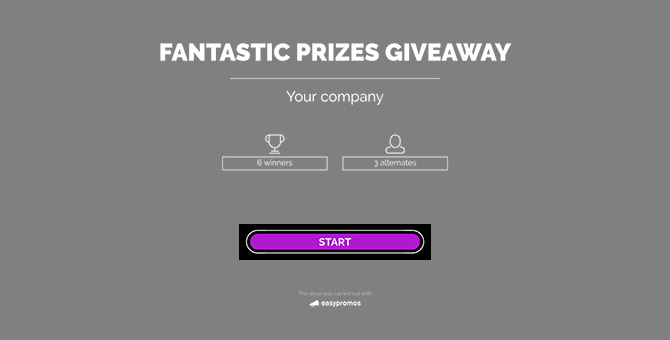 The Broadcast Mode gives you the option of announcing the result of your giveaway in a dynamic way by showing the winners in video format to add surprise and entertainment to your giveaways. With the Broadcast Mode, you can download a video of the winner selection that you can share on your social network profiles. 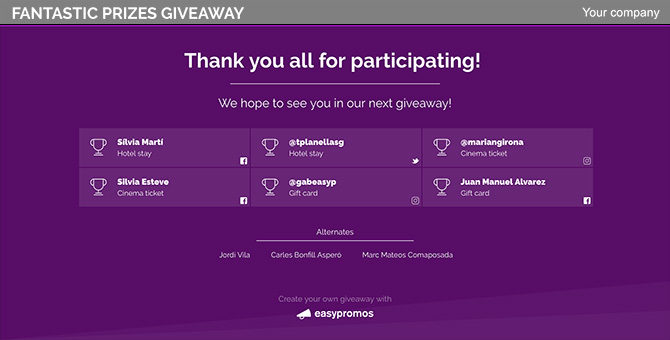 The Broadcast Mode of the giveaway is the ideal format for sweepstakes carried out during live events because it helps create excitement when announcing the winners. You can also use the Broadcast Mode to show the winner selection in video format that you can share on your social networks. To activate the Broadcast Mode, the giveaway should be finalized, meaning that you should have already selected the winners and the alternate winners. So, first of all, you need to follow the usual steps to obtain the winners. Note: You can find the step by step tutorials here, according to the type of giveaway you've run. Title: This is the title that will be shown on the different pages of the Broadcast. Organizer: Here you should write the name of the company/brand. End page title: This is the message that will be shown on the last page. 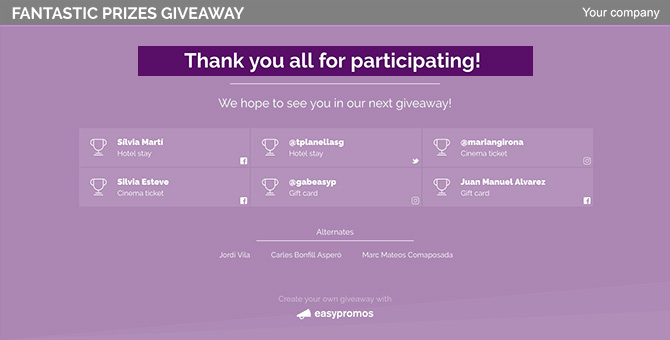 You can use it to thank the users for participating in the giveaway. End page subtitle: This message goes underneath the title on the last page. You can use it to encourage users to look out for new giveaways. Color: The color is used for some of the elements in the Broadcast Mode, for example the 'Start' button, for the confetti effect when the name of the winner appears, for the background color on the last page, etc. Manual: This is the default setting which allows you to go to the next screen manually by clicking. It's the recommended option if you're using the Broadcast Mode in a live event, it will help create excitement among the audience. To go to the next screen you can either click with the mouse or with the space, the Enter or the right arrow key. Automatic: Allows the transition from one screen to the next to be automatic, the system will continue when ready. This is the recommended option if you're using the Broadcast Mode to share the result of your giveaway on social networks. Show alternate winner: Check this box if you want to show the names of the alternate winners in the Broadcast mode. This option is only available in giveaways with 10 or less alternate winners. Next page link text: The text that you will click on to go to the next screen. 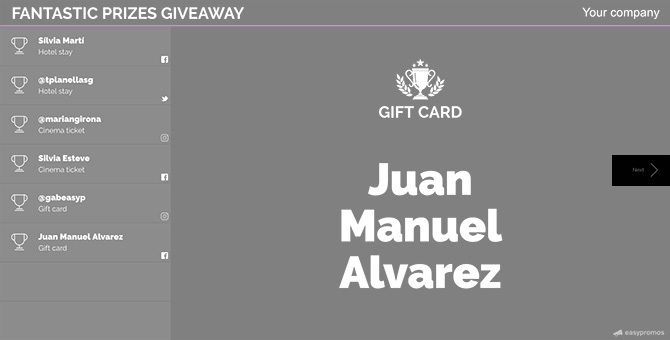 Label alternates: The text to present the alternate winners of the giveaway. 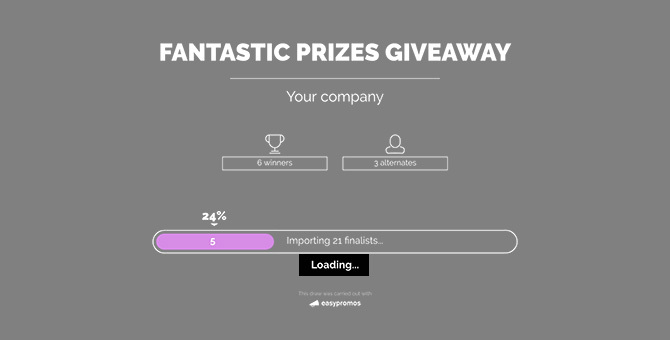 Loading message: This is the text that shows when the finalists are loaded right before showing the first winner. Start button: Text of the button where you start the Broadcast. 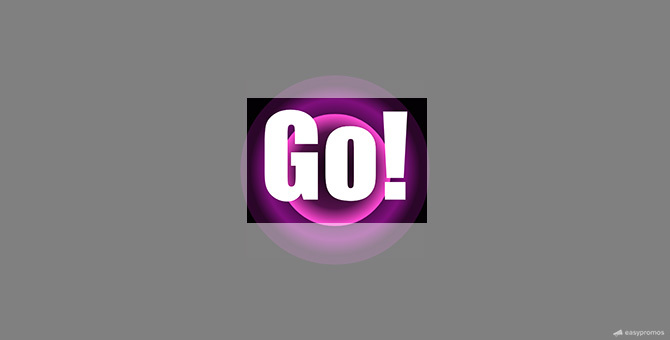 Go! : This is the last text right before showing the first winner of the giveaway. 4. Once you have configured all the customization options, click on 'Save changes' and you will be back on the management page of the giveaway. Presentation link in Landscape mode (TV optimized). Presentation link in Vertical mode (Mobile optimized). Click on the link that has been generated to preview what the Broadcast Mode looks like before sharing it. Note: You'll be able to edit the customization option at any time. If you’ve downloaded the video file, you need to download it again to get the new version. Here we will give you some recommendations to how to share the Broadcast Mode with your followers to how to announce the result of the giveaway in a dynamic and entertaining way. A good practice is to share the result of the giveaway on social media in video format because video posts get a much higher organic reach. Landscape (1280x650): Recommended to share the video of the draw on Facebook or Twitter. Vertical (568x1012): Recommended to share the video of the draw as Stories. 3. The video will be exported in WEBM format which is a format that's optimized for social media. 4. If you need the video in another format, for example MP4, there are several online tools that can convert videos from one format to another. You can use this tool to convert your Broadcast video into .MP4. 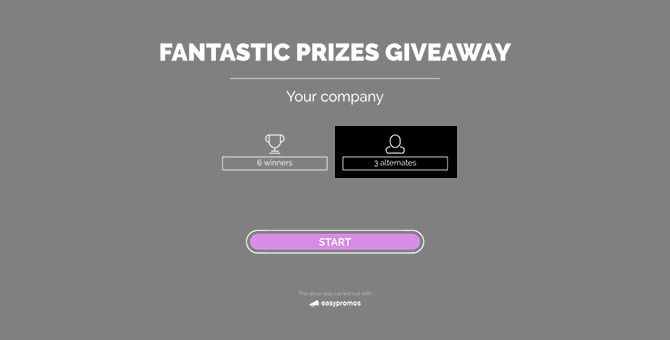 If you're organizing an offline event, for example a conference, a trade show, etc., running a sweepstakes among the attendees can be a good way of creating more engagement and traffic to your stand. In this case, the Broadcast Mode is a great tool to show the winner selection in an exciting and fun way. 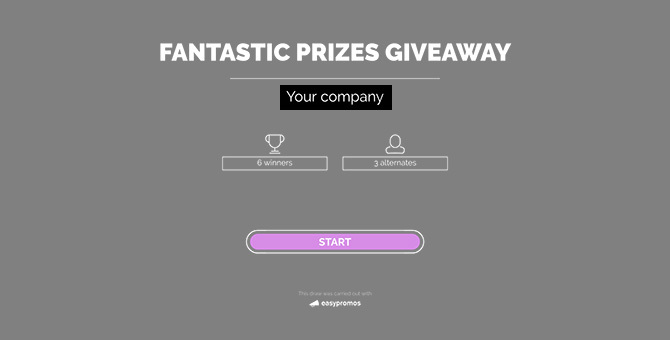 Once you have selected the winners, edit the Broadcast presentation and customize it as you wish. Note: We recommend that you leave it with "Manual" transition to have better control over the progress of the Broadcast at all times. This option is especially interesting if you have a presenter in charge of announcing the results of the sweepstakes. If you have internet connection at the event, we recommend that you open the link to the Broadcast in an internet browser and project it on a screen. If you don't have internet connection, you can download the Broadcast presentation in video format and project the video on a screen. 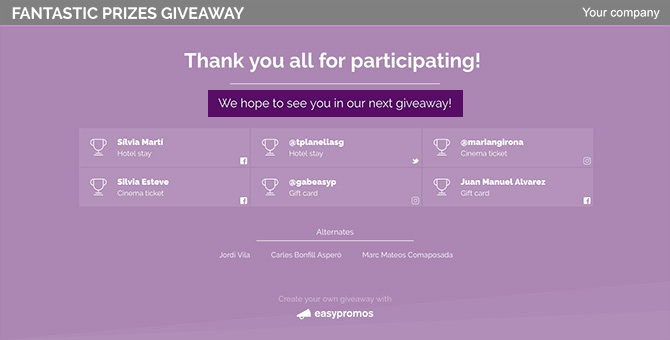 Once you have the winners of your giveaway, edit the Broadcast presentation and customize it as you wish. Next, copy the link to the Broadcast presentation and open it in a browser window. Preview the presentation before going live. When you're ready, begin the live transmission on your preferred social networks.